I'm ready for another Year of Writing Deliberately. A Year of Writing Deliberately was born back in 2010 when I read about Jennifer's idea of the Year of Reading Deliberately, the thoughts started rolling about in my head about being deliberate with not only my reading, but also writing as well. Deliberate - "Done with or marked by full consciousness of the nature and effects." How often do we go through our days on auto pilot, not giving conscious thought to what we are doing. Never fully in the moment, but thinking about what needs to be done next, splitting our attention away from what actively doing at the moment. The challenge will run in 80 days increments, 4 times a year with a break between. Your goal can be anything you like as long as it is MEASURABLE. If you’re already in the middle of a WIP, that’s fine. Tailor your goal to suit that. You may even want to set mini goals (I want to finish the last 40k of this novel. Then I want to spend the last 20 days revising it at x pages a day.). There are a lot of elements to writing a book other than the writing itself. Plotting. Outlining. Character Interviews. Whatever. Set your goal to match wherever you are right now on your WIP. If you want to use your Round for editing a novel, that’s fine too. Just know that this is, at heart, a writing challenge, so all the weekly inspirational posts will be geared in that direction. There’s no mandatory daily word count. Every writer is different, everyone has different schedules. You set a goal that works for you. Find a way to make writing a priority in your life in a way that FITS. But set SOME kind of schedule and be CONSISTENT. 2011 - Blue Steel. I've reviewed each story and since my brain is totally immersed in Blue Steel, going to work on it first. 1) Blue Steel: Update novel Bible, research story points, complete characters sheets, edit, and polish, find beta readers and ready for querying. 2) Breakdown into measurable weekly goals. 3) Take an online Writing Course through Savvy Authors and/or Gotham Writers Workshops. 4) Join IRL or online Critique Group. 5) Write at least 2000 words a day which equals 4 handwritten pages front and back. I hand write all my stories, then type them up essentially completing a 2nd edit. 6) Develop 2012 Nano story - Green Ice (working title for now) and utilize K.M. Weiland's suggestions in Outlining Your Novel to prepare the story first. 7) DYI MFA - Read and study the following craft books. Now we just need to work on our Health, Home school and business goals which I won't detail here. What goals are you setting for yourself for 2012? ~Cheers to a wonderful, happy, creative, imaginative, writing new year! I wish you much luck and success with your writing in 2012. I have Cameron's book and should dig it out. I'm going to try my hand at digital scrapbooking and participate in One Little Word. I hope to journal a lot this year! 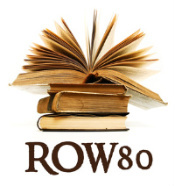 Looking forward to another year of ROW80 with your Robin. You have a lot of clear goals set for yourself and I wish you much success with them. I hope you had a wonderful Christmas and wishing you a happy and prosperous new year! Awesome goals. Sometimes just writing out your goals is a huge help. Happy new year and may it be productive!